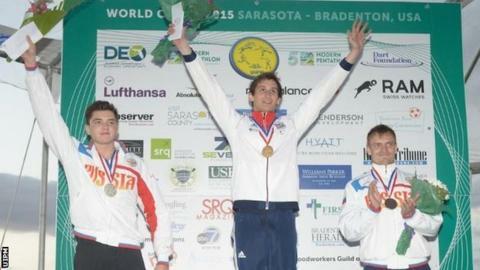 Great Britain claimed double modern pentathlon gold at the World Cup event in Sarasota as Jamie Cooke followed up Samantha Murray's success in Florida. Cooke, 23, sealed victory by overhauling Egypt's 2014 world silver medallist Amro El Geziry after the second of four shooting stages. Earlier, world champion Murray began her season in style by claiming gold in the women's event. "The plan is Rio and this a good start to the year," said Cooke. "We've worked really hard over the winter period, the whole boys' team and the girls' team, and I think it has been reflected here because obviously Samantha won yesterday and Kate French came third." Pentathlon GB performance director Jan Bartu added: "These results far exceeded our expectations. "I can't remember us doing this before [winning both individual golds]. We are all over the moon and it's fantastic." Cooke's triumph followed consistent performances across the four events - fencing, swimming, riding and the combined run-shoot. "Jamie put in one of his best fencing competitions ever and that set him up," he said.